The Paul Feeney Group Race Team is heading to the second last round of the SP Tools Australian Kart Championship with the aim of picking up where the majority of its drivers left off last year – and that’s fighting for race wins and standing on the podium! Of the drivers currently in the six kart team, two ended last year with podiums, with another narrowly missing a trophy. In what has been a developmental year for its junior KA2 drivers, Jarrod Hughes and Connor Roberts, both have shown improvement over recent events locally – Hughes setting a new lap record at the Warwick circuit – and on the national scene and are hoping they can lift themselves up the order and into the top 10 at the super fast, very technical Emerald circuit. Currently Hughes is 16th on the points standings in his rookie year in the elite junior category aboard his Zupps Holden backed kart while Roberts is currently 24th in his Arrow Transport-backed Kosmic. After missing the last round at Newcastle due to injury, the Feather siblings are aiming to put in a top performance in the only visit the AKC pays too their home state of Queensland this weekend. Ethan is best placed of the Electro Industries-backed duo sitting in 16th position, while his sister Maddie – who scored her first AKC podium last year, was engaged in a huge battle for the win in Cadet 9. She sits further down the order. Maddie will be looking to use her experience from last year to be in the mix in Cadet 12- her first year in the category. The PFG drivers in KA1 – Broc Feeney and Mat Stenner – are both in with a good shot of getting themselves onto the podium of the category at the end of the season, with Feeney still in contention for the outright Championship win. Feeney is fourth on points – 38 off current Championship leader Scott Sorensen, while Stenner sits fifth on points – 80 behind Sorensen. The Queensland-based Penrite Oils, Labrys and PFG backed pair have both scored one second place in finals this year – but both have also shown great pace throughout the course of the weekends. This fourth round, they will be looking to piece it all together and secure the elusive first win of the season. Both were exceptional at Emerald last year, Stenner securing his first ever AKC podium and Feeney leading much of the KA2 final, eventually being pipped for third on the line. The action officially gets underway on Friday with practice before qualifying and heats Saturday with the event coming to a conclusion on Sunday. 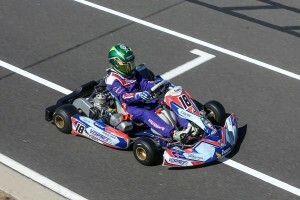 Sunday’s events will be livestreamed through www.karting.net.au or shared via www.facebook.com/paulfeeneygroupraceteam.